I’m excited to be importing Château d’Assas wines, named for the home of Simone Demangel, who made false identification papers for my father and grandparents in World War II. The Classique is made from Syrah and Grenache, aged in concrete. Making wine is often a family business. For a lot of First Vine’s producers, the vineyards and wineries have been in the family for a century or more. And something about growing up growing grapes and making wine seems to interest at least one family member in each generation. Even when the children go off and do other things for a while, many find their way back to the farm and the press, bringing new twists to the family business. My family isn’t a wine dynasty, at least not good wine, anyway. My maternal grandfather came to the U.S. from a farm near Naples before World War I, and like any self-respecting Italian, made wine at home (and prohibition made it literally a cottage industry for many). Over here he bought grapes and then fermented and bottled the wine in his basement in Brooklyn. My mother tells me that it tasted so bad she had to mix it with cream soda to make it palatable. So I figured that was it for a family connection to wine. But it turns out that’s not the only one. While I’m not related to the winemakers, there’s a wine that’s definitely part of my family’s history. I’m pleased and proud to announce that First Vine now imports two wines labeled Château d’Assas from Les Vignerons du Pic, the cooperative winery in Assas, a village north of Montpellier. Château d’Assas in the sunshine, when I visited this past April. Two years ago I wrote about the trip Cy and I took to France with my father to visit the village where he and his family lived during part of World War II after fleeing Vienna and Brussels. 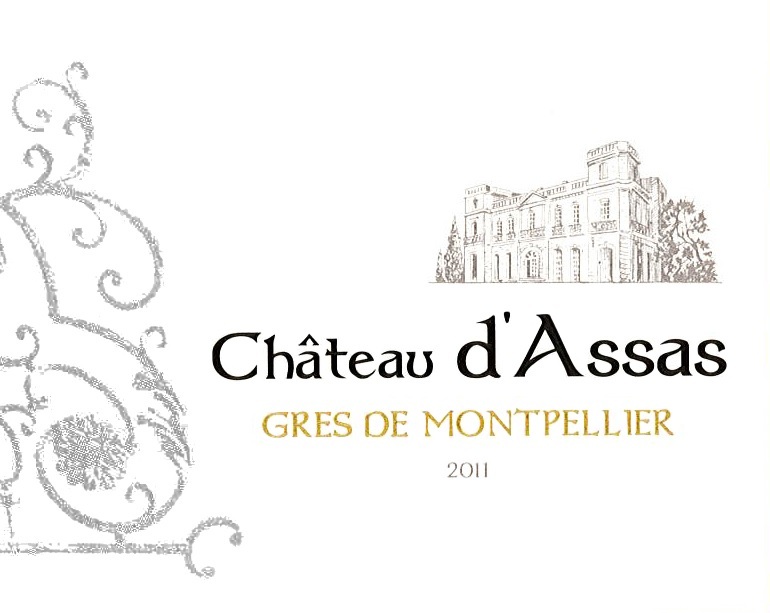 And also visiting the Château d’Assas itself, which is owned by the Demangel family. What’s the family connection? In 1942 Simone Demangel made false identification papers for my father and grandparents to leave Hérault in that very house, after Germany began mass deportations of Jewish people living in the region. Simone’s family agreed to allow the cooperative to name some of its wines after their home for a few reasons. First, because winemaking is the principal industry of the village and the surrounding area. In fact, Simone’s daughter Marie-Claire told me when I first visited that the Germans prohibited the transport of food from one village to another during the war — and since Assas produced only wine grapes, there was a serious food shortage there. Second, some of the grapes in the wine are grown on land that used to be part of the Château d’Assas estate, so it’s only fitting. And last but not least, to honor Simone and her resistance work, saving the lives of dozens, if not hundreds of people. 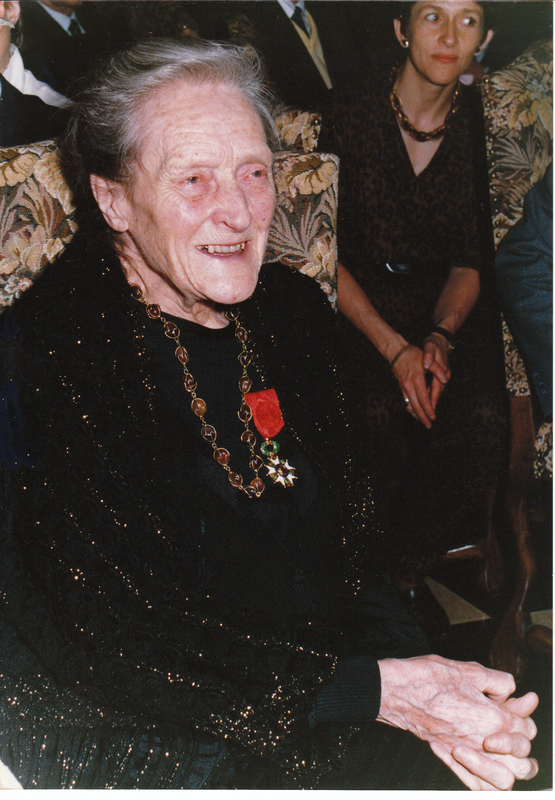 Simone Demangel received the Legion of Honor from General Jean de Lattre de Tassigny, leader of the Free French Army, in recognition of her work as a resistance agent during the war. It’s impossible to overstate the danger to Simone and her family from her courageous activities. One of Simone’s friends who worked in the Montpellier City Hall and provided her with blank forms and seals for her work was sent to a concentration camp when his part was discovered. Marie-Claire told me that, fortunately, he survived and returned after the war. She also described how later in the war she and her sisters were hidden in a Dominican convent to protect them and to keep them from being used as pawns in the German authorities’ search for Pauline. While there, the girls got to understand the inner workings of the resistance, as Jewish children and British paratroopers who had been shot down over France passed through the convent to safety. It seems astonishing to us reading this 70 years later to think of what they lived through. But as Marie-Claire, my father, and my mother-in-law (who was born and grew up in Holland, and has her own fascinating wartime story) told me, they were children and didn’t know anything different. That’s just the way life was. I imagine, though, that for adults like Simone, the decision to join the resistance was an agonizing one because they knew how much was at stake. 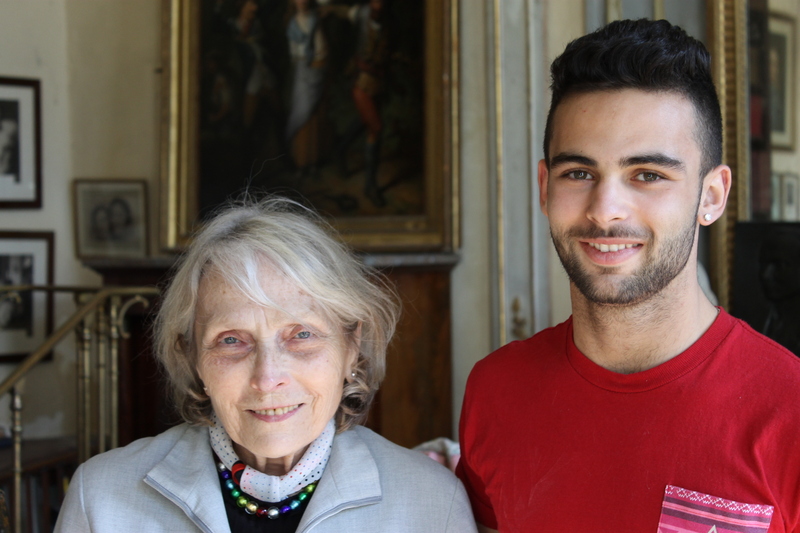 Marie-Claire Demangel, one of Simone’s three daughters, with her grandson Alex this past April. As I mentioned before, I’m happy to be able to pay a small tribute to Simone, and those like her who risked their lives to help others during a terrible time. I’m not certain how many of the people Simone helped actually knew it was she who made their false identification papers. While some of them may have met Pauline, she was part of a network of people working to get them to safety, and it’s unlikely any of them knew her identity even if they met her. And it isn’t certain that Pauline would have known the true identity of the people she helped, either. It was sheer coincidence that my father was a patient in the same hospital where Simone was working, and that she and my grandfather met. I hope anyone who reads this and knows about Pauline will learn her identity and recognize Simone for the brave person she was. It gives me a sense of pride to hold a bottle of Château d’Assas wine and think of what it means to me and my family. All the more since they’re excellent wines. I’ve written about the new Languedoc appellations before, and these two reds are classified as Grès de Montpellier for the limestone in the soil. The climate has many advantages for growing wine grapes, winds from the Mediterranean provide humidity which enhances flavor, and the bigger winds from the northwest keep the leaves of the vines dry, preventing rot and fungus with much less (if any) chemical treatment. Château d’Assas Classique is 70% Syrah, 30% Grenache, with great fruit and a hint of violets when you first smell it, then the ripe fruit, and the pepper and earthiness come on later. 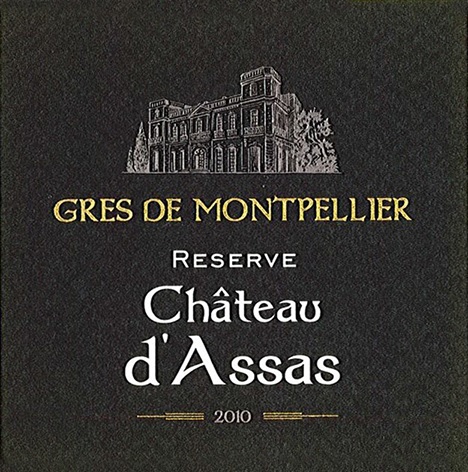 Château d’Assas Réserve is 60% Syrah, 30% Grenache, and 10% Mourvèdre. It has a little vanilla from the oak that also tames the Mourvèdre, allowing the ripe fruit and hint of clove to come through. They’re both medium- to full-bodied and the winery recommends that you pair them with lots of meat. Not that I mind meat or anything, but I thought it would be nice to have something a little lighter. And a dish that’s also part of my family history. My mother grew up in a house where the same thing was served every Monday, every Tuesday, etc. So I was lucky that when she started cooking for our family she tried a lot of different things. We rarely ate the same thing more than once a month. She always had a lot of cookbooks around, especially compared to my friends’ mothers, and to this day she loves looking for new recipes. Over the years favorite dishes have come and gone, but you can always count of finding one thing in the freezer every winter: minestrone. The recipe my mother uses is from an Italian cookbook she bought in the late 1950s or early 1960s. These days, minestrones are more like stews and are chock-full of vegetables, sometimes exotic pork products (like guanciale), and trendy greens. Nothing wrong with these, they’re delicious. But minestrone was born in poverty, and traditionally was more soup-like. A couple of zucchini and potatoes here and a bit of cabbage and tomato there, with beans and maybe a little bacon or pancetta if they had it. If they’d had more vegetables, they might have made something else with them. Plus, cooking vegetables with the beans for an hour and a half gives the liquid a lot of flavor, even if it’s not piled high. This recipe is more peasant-style soup. I’ve made a few modifications over the years, but still do it pretty much the way Mom does. While it’s tempting to cut down on cooking time by using canned beans, soaking and cooking the dried beans tastes better. I cook them with a big piece of Parmesan cheese rind in addition to the cheese mixed in at the end, it gives the beans more flavor. Also, I’ve switched to fresh basil, which is available in the grocery store year-round, and added some dried oregano. This recipe goes pretty easy on the bacon — maybe four or five ounces for a pound of beans, but you can leave it out if you want and you’ll still end up with a flavorful soup. I add a mix of herbs, garlic, and lemon at the end. You don’t have to, but it brightens things up, especially a wintertime soup. Drinking one of the Château d’Assas wines with the minestrone definitely makes me think of family. And best of all, I don’t have to add cream soda! Prepare the beans: Soak the beans overnight in enough water to cover them by two inches Or you can quick-soak them by covering with water (again by two inches), bringing to a boil, the covering the pot and letting them sit for an hour. Cooking the beans: Drain the soaking liquid from the beans and add the 5 quarts of water and the cheese rind. Bring to a boil and cook over low heat for 1-1/2 hours. Meanwhile, prepare the vegetables. Add the cooked vegetables to the beans and their cooking liquid. Stir in the diced tomatoes and cabbage and cook for an hour and 15 minutes. Taste the soup for salt and pepper and add more as needed. Stir in the rice and chopped parsley and cook 20 minutes longer. Turn off the heat and stir in the cheese. To prepare the topping: cut the garlic cloves in half and put them in a small saucepan with the olive oil. Turn the heat under the pan to low and cook the garlic slowly until it just starts to get golden. Take the garlic out and let it and the oil cool separately (you can leave the oil in the pot to cool). After you add the rice to the soup, put the herbs, the lemon zest, and the cooled garlic on a big cutting board with a quarter-teaspoon of salt and some pepper. Using a large knife, chop everything together until it’s all minced. Stir the mixture into the cooled olive oil, then either top each bowl of soup with a little topping or put it in the bowl and pass it at the table. 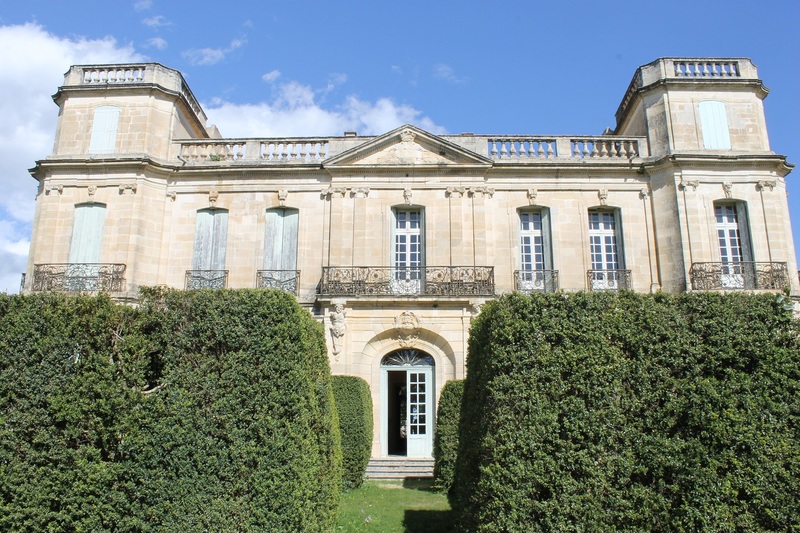 This entry was posted in Château d'Assas, Jewish Refugees in France, Musings/Lectures/Rants, Simone Demangel, Tom Natan, Uncategorized, wine delivery washington dc and tagged AOC Languedoc Wines, Assas, buy wine online dc, Château d'Assas, Château d'Assas wine, French Resistance in World War II, Gres de Montpellier wines, Languedoc Wines, Les Vignerons du Pic, Marie-Claire Demangel, Minestrone, Simone Demangel, Tom Natan, wine delivery washington dc, www.firstvine.com. Bookmark the permalink. Hi Sue, thanks! It is fascinating reading about Simone’s life and learning about just how many people like her there were. Marie-Claire also wrote about one of her mother’s resistance associates who couldn’t take living in France after the war where he was surrounded by people who had either collaborated or had done nothing to help others. It was such a terrible time, I hope none of us has to make that kind of decision. The wine was a lucky find! I hope everyone enjoys it. And I was happy to see that mom had some minestrone in the freezer this visit, as I’d hoped she would.